Machrie is on the west end of the string road; built across the centre of Arran in 1817 by Thomas Telford. Machrie is home to artefacts dating from the Bronze Age. 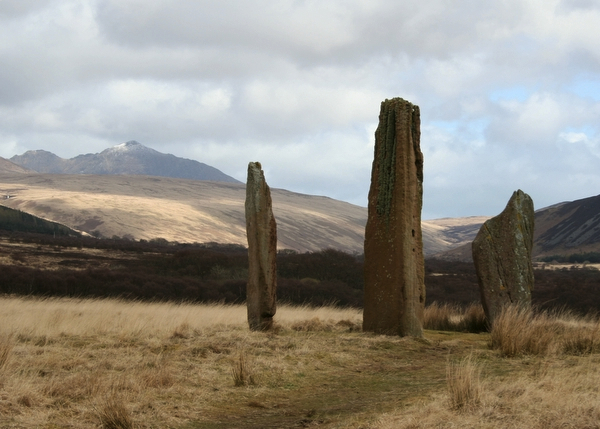 Hut circles and standing stones can be found on Machrie Moor. The most distinguishable of the circles consists of three upright red sandstone pillars, the tallest of which is just over 18 feet high. Many of the other stones within the circle have fallen and two of the granite boulders within the circle have been carved into millstones still in situ. The other tall pillar closer to the abandoned farmstead, looks like a solitary standing stone but is part of a larger circle, the stones of which have been removed or lie buried. The second most interesting circle is a double ring of squat granite boulders called Fingal's Cauldron Seat. The outer circle is egg shaped but the inner ring of eight stones forms an almost perfect circle. When this circle was excavated a ruined cist was found but it did not contain any traces of burial.